Nathalie Katsonis was born in Austria. She received a PhD from the University Paris 6 (France) in 2004, working on the nanoscale probe of molecular self-assemblies. She then joined the group of Prof. Ben Feringa at the University of Groningen (the Netherlands) as a postdoctoral fellow, extending her research interests to the self-assembly of artificial motors and photo-switches. In 2008 she became Associate Researcher at the French National Center for Scientific Research (CNRS Toulouse, France). In 2011 she moved to the University of Twente (the Netherlands), where she is currently Professor of chemistry. 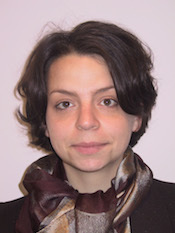 Nathalie Katsonis is the recipient of a number of research grants, including an ERC Starting Grant and a Vidi Grant from the Dutch Science Foundation. She is member of the Young Academy of the Royal Netherlands Academy of Arts and Sciences and was elected to the Global Young Academy. The research interests of her group include the design, synthesis and operation of molecular machines, and the development of bio-inspired and stimuli-responsive materials. 2012 University of Twente "Prof. De Winter Prize"
2018 Supr@Lyon “Supramolecular chemistry at work”, Lyon, France.